A transforming vision of human intelligence. Ever since Alfred Binet invented the first IQ test more than a century ago, we have thought of intelligence as fixed from birth and unalterable-as genetically programmed and immutable as eye color. If our IQ was 115 at the age of eighteen, it would be 115 at age thirty-two and at age seventy-two. But as Michael Martinez reveals in Future Bright, human intelligence is not at all a static quality. Drawing on cutting-edge research, Martinez shows that not only can we improve our IQ scores — with the right approach, we can improve intelligence itself. Future Bright introduces the radical view that intelligence can be learned. Ranging from the search for Einstein’s brain to the curious case of a railroad worker whose frontal lobe was pierced by a tamping iron, Martinez looks at some of the most fascinating stories in the history of cognitive science, revealing how researchers have sought insight into intelligence by understanding more about the brain. We see how the physical structures of the brain relate to how we think, discover how memories are made, and examine the several kinds of intelligence. Martinez then explores the astonishing evidence from recent cognitive science that intelligence can be learned. Equally important, he concludes with ten strategies for enhancing our intelligence, beginning with the all-important idea of making improved intelligence a conscious goal, and including such ideas as reading books, learning to be an expert, finding where our talents lie and, not least, eating well and exercising, both of which improve brain function significantly. Genetics is only one of the factors that shape our intelligence. 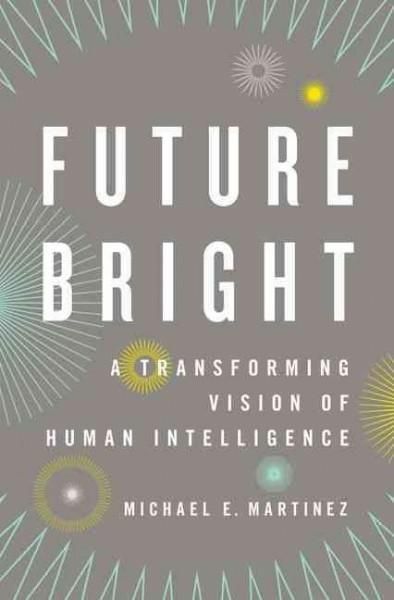 Future Bright highlights the many ways that the environment and education can increase our brain power, promoting the growth of a more intelligent society–one that will lead us into a brighter future.